Much of Noel Betowski’s work makes accessible the semi hidden. 2014 saw the culmination of work spanning 40 years in an extensive show at Penwith Gallery, St Ives. By combining memories and shapes associated with childhood; discs, grids and geometric patterns begin to form an unusual camouflage linking to nature and objects stationed within it. 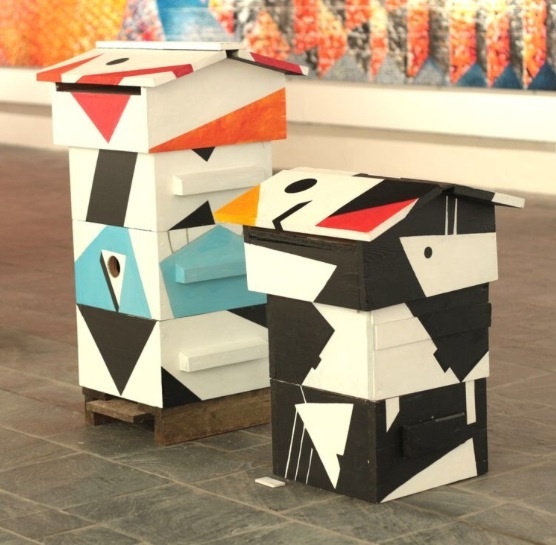 Strongly referencing the deceptive disguise of World War I Dazzle Ships, Noel has incorporated an ancient Eastern European tradition of decorating beehives, this renders the Dazzle camouflage useless as bees are unaffected by the UV spectrum utilised in the designs. Based in Penzance, Noel has exhibited consistently since the late 1980s and a winner of The ‘John Constable Landscape Prize‘ at the Camden Annual, London.